Since 2000, America’s most ambitious young evangelicals have been making their way to Patrick Henry College, a small Christian school just outside the nation’s capital. Most of them are homeschoolers whose idealism and discipline put the average American teenager to shame. 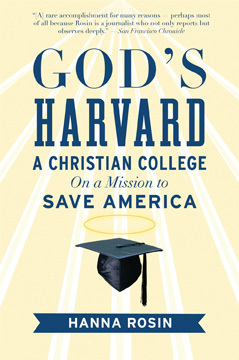 At “God’s Harvard” they are groomed to become tomorrow’s elite. Diplomas in hand, they are dispatched to the front lines of politics, entertainment, and science, where they will lead the battle to take back a godless nation. Hanna Rosin spent a year and a half embedded at the college, following students from the campus to the White House, Congress, conservative think tanks, Hollywood, and other centers of influence. Her account captures this nerve center of the evangelical movement at a moment of maximum influence and also of crisis, as it struggles to avoid the temptations of modern life and still remake the world in its own image.